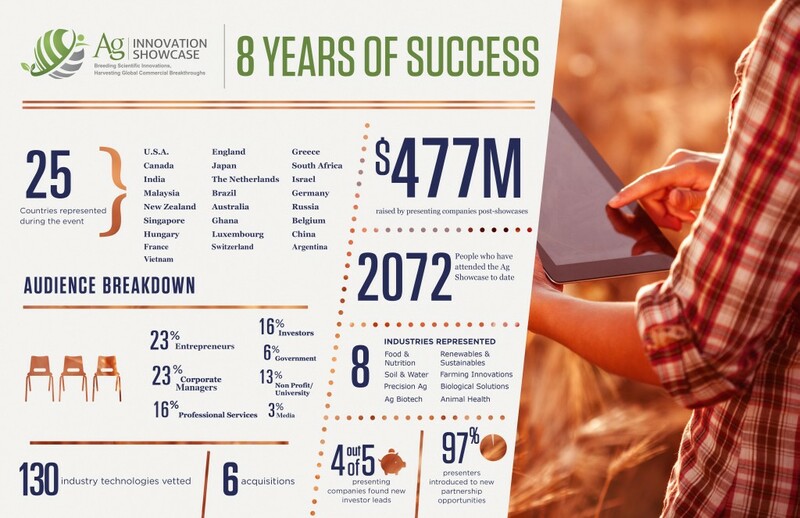 The Ag Innovation Showcase is the leading annual global event held in St. Louis where the most influential and forward thinking minds in Agriculture gather. Speakers and presenters will encourage influential discussion around new industry ideas and current trends. St. Louis is welcoming more than 300 industry game changers to learn about the potential and pitfalls of precision agriculture, the role of big data management and IT in Ag decision making and the role of biologics in Ag. Over the course of each year, the Showcase partners identifies, selects and promotes emerging technologies in ag-bio, food and nutrition, biofuels, sustainable materials, clean-tech, information technology and animal health. The Ag Innovation Showcase is a joint effort of BRDG Park, the Donald Danforth Plant Science Center and Larta Institute. For more information, visit www.agshowcase.com or view the Ag Showcase infographic.